What happens to the nomad lifestyle once you have kids? One of the privileges of working with Nomad Capitalist is the opportunity it gives me to connect with so many incredible individuals living extraordinary lives– from perpetual travelers ( people that are constantly on the move), expats with a home base/s to digital nomad pioneers and those just starting their nomad lifestyle. In each conversation, we talk about their travels, their businesses, their investments, and their plans for the future. They are free to travel and explore to their heart’s content. However, one question stops most travelers in their tracks: Is there anything that would make you settle down and stop traveling?” While many nomads respond that they have no plans to put a stop to their travels, I have been surprised by the number of individuals who said they would call it quits for one particular reason: kids. If you simply don’t want to travel or have children, that’s your prerogative. I’m not here to tell you that you should. What I am going to tell you, however, is that kids have nothing to do with whether or not you can travel or live the Nomad Lifestyle. In fact, there is an entire community of individuals who travel precisely because they have children. They call themselves worldschoolers. Not only do these families travel all over the world but they use their travels to give their children an education beyond anything they would ever receive within the four walls of a classroom. If you’re new to the idea of world schooling, it may sound like a complete revelation. I knew it was for me. When my husband and I chose to live in Mexico, we also decided that we would move back to the United States when our children were school aged to take advantage of the public school system there. The US education system is nothing close to perfect, but we knew it was better than Mexican public schools and we weren’t too keen on the private schools either. For some reason that is totally lost on me now, we seemed to think that those were our only two options. I was stuck in the same mentality that plagues so many people today: adventure was the privilege of the young (or retired), and the responsibility of parenthood meant living in one place for twenty plus years of my life so that my children could go to school and be ‘educated’. As is the case with most things ‘location independent’ in my life, I have Andrew to thank for opening my eyes to the possibilities of world schooling. He was interested in the topic and my curiosity was piqued the moment he mentioned the concept. His idea? I would write a book about it. As crazy as it seemed to write a book about a topic I knew nothing about, it made absolute sense to me. Writing is how I learn and education is one of those topics about which I am insanely passionate. So, I accepted the challenge. I dove deep into the topic, interviewing families who had world schooled for years, reading every available book even remotely related to the topic (because there was no book specifically about world schooling at the time), and scouring websites, blogs, and research archives for months on end. What I found was truly incredible. In fact, it was so incredible that there was no way to explain it all except to write a book about it. In the book, I broke world schooling down into three separate questions. The first question is to consider WHY – from an educational perspective – you would choose to world school in the first place. Your child’s education is not a decision that should be made lightly. It is clear that every parent wants ”the best’ ‘for their child, but then again the definition of the best varies from one family to another. So, whether you choose to world school or not, it is essential that you understand the purpose of education and how well your chosen schooling method helps you achieve those goals. The second question looks at HOW you actually world school. Here we dive into all the wordscholling approaches I could possibly find in real life from researching and interviewing families living a nomad lifestyle I had a pleasure to connect with. There are four main approaches that encompass a wide range of options. One of the common misconceptions about worldschooling is that it can be done only through long term travels. The truth is worldschooling is more of about the mindset than the duration of your travels- it is a response to the question ”why” you travel not ”how long”? The common link for Settled Globetrotters is that they have one home base/location where they spend a majority of their time, but travel occasionally. Occasionally is a subjective term, but in practice, it could be from few days to up to a year. Families who adopt this approach are usually those who are still working on making their business/source of income location-independent, or have business or family ties that do not allow them to travel full-time. Also, this is a good option for those who crave stability of a community for them or their children. It is also a great first step in exploring a more travel-focused concept and later on adopting full wordschooling nomad lifestyle. So, Settled Globetrotters set up shop in one location – be it their home country or a foreign local – and they either enroll their children in a nearby school or use an alternative educational approach of their choice, and then regularly travel from their home base. Remember, how much you travel with your children matters much less than why you travel. So don’t make the mistake of thinking that two weeks out of the year isn’t enough. Unconventional traditionalists know how to take the best of the traditional system and combine it with untraditional or unconventional ways of education, meaning that they in a way ” use the system to beat the system”. They do that by choosing to use public and private schools wherever they travel to give their children an opportunity to socialize and be immersed in the local culture and language. 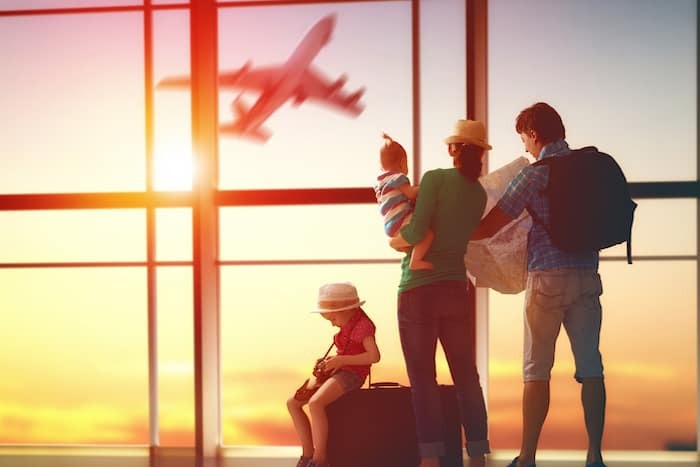 Many families have had luck getting their kids into schools for periods of time as short as three to four weeks, so don’t think that this is only an option for slow travelers. This is especially true if you’re the kind of family that doesn’t spend a large chunk of time in any one place. Being on- the- go is not that conducive to the time commitments that schools will expect. The good news is that homeschooling isn’t some lower quality of schooling you have to settle on because of your nomad lifestyle. With the right mindset and parental commitment, homeschooling can be a great choice among the many available educational options. It can also be done in more than a few ways, which I address in details in the book. For some, that means learning certain skills as reading, arithmetic, writing, drawing in a certain age and following a certain structure. For others, mindset and so called ”soft skills” are the ones that require a more structural approach. Unschooling, or Growing Without Schooling is “to live as if school does not exist.” Out of all it is the most difficult to describe since it is the least formal and structured educational option available to parents and children. However, the basic philosophy of an unschooling approach relies upon the belief that children have an innate drive to learn and that they are fully capable of self-directed learning. Unschooling parents possess a simple trust in a child’s instinct to learn and grow. They recognize that each child will advance at their own pace, but that they will advance as they discover themselves, their interests and their needs in order to function and succeed in life. This trust is rooted in the deeper philosophy that the most important lessons any of us learn are learned from life itself. Unschoolers, more than any other group, see school as an abnormal environment in which unnecessary adult direction and confinement inhibits a child’s natural curiosity to ask their own questions and explore and pursue their own interests. Life is the teacher and the world is their classroom. World un-Schoolers live this creed to its full extent. Just as travel adds a priceless element to all the other approaches, unschooling becomes truly powerful when it is combined with world travel. Adding travel into the mix means World un-Schoolers are a truly singular group of parents and children blazing a completely new educational path into the future. A common strategy used in unschooling to pique children’s interests is ” strewing” (by Sandra Dodd). The idea is to strew interesting things along our children’s paths that they can then choose to pursue or pass by depending on whether or not it interests them. For World un-Schoolers, the power of travel means that the world will strew for them- the world doesn’t just become your classroom, the world becomes your teacher. The places, the history, the people, the languages and the demands of a traveling life all contribute to a learning lifestyle beyond anything your child would ever receive within the four walls of a classroom. What I find so appealing about world schooling is that every approach uses hands-on, real world experience through travel to enhance whatever educational method you choose. Rather than learn about Renaissance art from a textbook, worldschoolers discover Michelangelo with a visit to the Sistine Chapel and the Statue of David. Instead of working on math problems while they wonder when they’ll every use such concepts, worldschoolers help their parents calculate exchange rates and budget trips. Instead of going to a language class or listening to audio books, worldschoolers actually play with children that are native speakers and, in place of outdated maps hanging in stuffy geography classrooms, worldschoolers study maps on buses, trains and planes on their way to discover the locations in person. Obviously, these are just quick examples, but you get the idea. The final question the book addresses is what you need to make a world schooling lifestyle possible. There is a chapter full of educational resources, another with travel hacks and financial advice, and a final chapter on how to put your world schooling game plan together and make the plunge. Chances are, you’ve already made the plunge to travel the world, all you have left to do is add kids into the mix! If you do read it, I’d love to hear what you think. All you have to do is leave a review. I read every one! 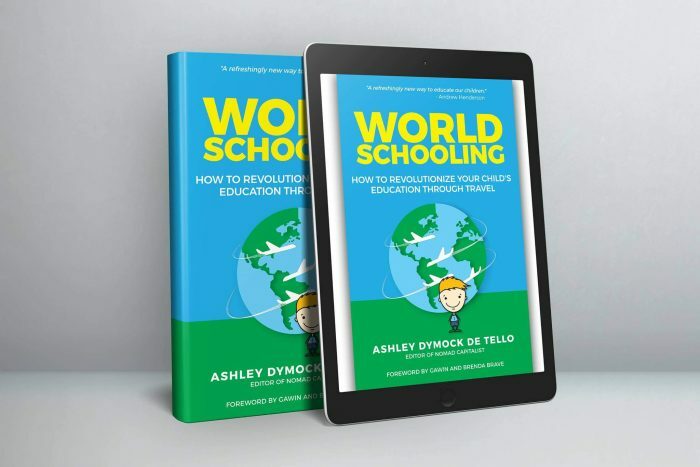 Ashley Dymock is the author of World Schooling, a book on how to keep your nomadic lifestyle when you’re ready for the next phase of your life and to have kids. Many people feel like they should give up their lifestyle and settle down somewhere. Well, Ashley says no! Your words and perspective resonate with me so deeply I am nearly in tears. This is inspirational and life-changing work. Thank you, thank you, thank you!